While it’s still technically summer, I’m sitting here typing this with freezing hands– the thermometer read 40 degrees this morning! So that tells me that despite technically being summer, my taste buds are ready for fall and there’s nothing more fall-like than pumpkin. Sure everything sooner or later will start appearing in pumpkin spice form and you might not even think you like pumpkin, but you need to give this cake a try. This pumpkin cake comes together very easily and the addition of maple syrup laced cream cheese frosting makes this cake even more quintessentially fall. 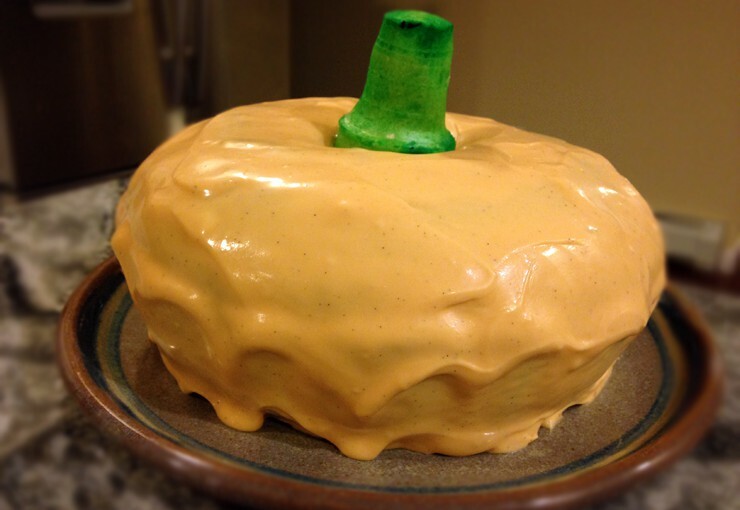 Tinting the frosting orange helps turn your cake into an actual pumpkin. This cake would be a wonderful centerpiece at a Halloween party or even at your Thanksgiving dinner. A centerpiece you can eat – now we’re talking. You can even take it one step further and double this recipe to construct a true Jack O’Lantern cake. If you decide to do this, make sure your frosting is thicker than the recipe below or it will be too difficult to decorate. Or stick with one Bundt cake as outlined below and top it with a green ice cream cone to look just like a pumpkin stem. I had trouble finding colored ice cream cones which I have seen in stores before; if you can’t find them, do what I did and use some green food coloring tinted water to “paint” your cone green. Improvise! This pumpkin cake is a fabulous fall recipe and may soon become one of your staples when the cooler weather starts to come around. Spray a Bundt pan with nonstick spray (I used coconut oil spray) and set aside. Preheat the oven to 350° Fahrenheit. Whisk together flour, baking soda, all spices, and salt in a medium bowl; set aside. In the bowl of an electric mixer, beat the sugar and oil until smooth, about 2 minutes. Add eggs one at a time and beat well after each one. Add the vanilla extract and vanilla bean paste and scrape down the edges of the bowl. Add half of the flour mixture and beat well; then add half of the pumpkin and beat well to combine. Repeat with the rest of the flour and pumpkin. Transfer the batter to the prepared Bundt pan and bake in the oven for about an hour, or until a tester comes out clean. Remove from the oven and cool on a wire rack. After about 15 minutes, run a knife along all edges and invert the cake onto the wire rack to cool completely. While the cake cools, make the frosting – in the bowl of an electric mixer, beat the cream cheese until smooth. Add in the confectioner’s sugar and beat well. Mix in the maple syrup and vanilla bean paste to fully incorporate them in the frosting. With the mixer on low, add 5 drops yellow food coloring and 1 drop red; if the color isn’t deep enough, adjust to your liking. Once the cake is fully cooled, frost and top with the green ice cream cone (your pumpkin stem).